I took half a day leave on Friday so that I can revise some work with my elder son. I thought of going to his school to pick him up after his lessons, only to realise that my dad has plan to bring him out for lunch. Luckily I managed to coordinate so that none of us actually needed to wait in vain. This is how fortunate my eldest son is. My dad picks him up from school at least once a week, and brings him out for lunch. Previously, my dad will coordinate with me, and "sort of" ask my "permission" to bring my son out after school. However, lately when my son started to take public transport to and fro school, and having his own handphone, both of them coordinate between themselves. I was not kept in the loop. It was only this year, when he is in P6, then we got him a mobile phone. Yes, we had no choice now because we want him to be contactable since he is taking public transport everyday. Otherwise, we will still prefer not to give him a mobile phone. He is the last person in the class to own his own mobile phone. Anyway, since I was waiting for my son to come home, I decided to bake some buns for breakfast for the following day. I made the Golden Crown Raisin Buns from Baking Code by Alex Goh. I had prepared the overnight sponge dough the night before. So I was ready then. While the dough was proofing, I was scolding my son. Despite giving him a proper schedule to follow everyday, he didn't follow them, and didn't attempt the assessment books that I bought for him. I was enraged! I blew my top. I wondered how to motivate a person like him. Most of the time, I left him to do his own work. I didn't want to disturb him as he always say I'm very naggy. Leave him alone, he didn't do the work. Check and tail him all the time, he'll find me naggy. I really don't know what to do. It's just so hard and difficult to coach him. I really wondered how I am going to survive the next 7 months before his PSLE! 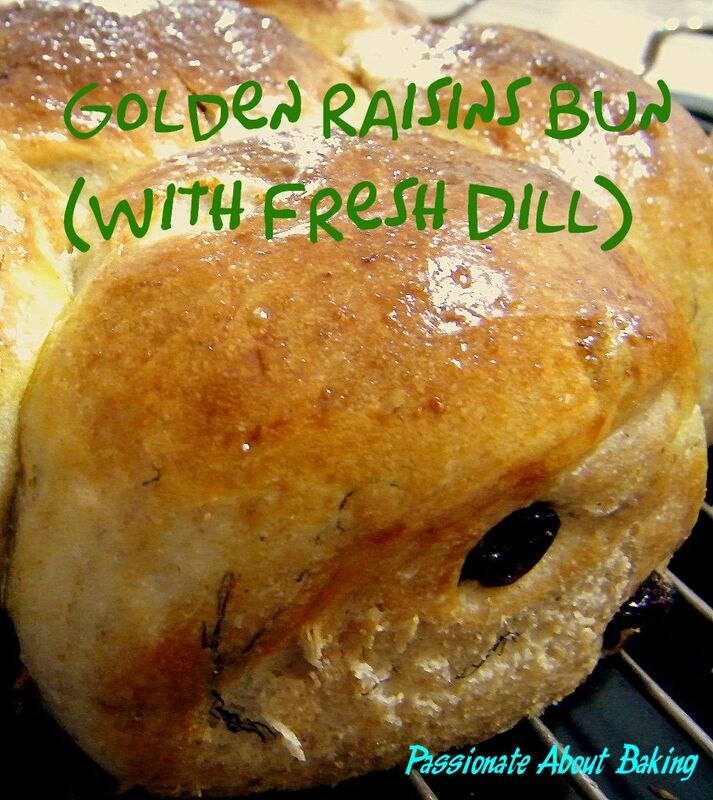 Anyway, back to the buns that I made. 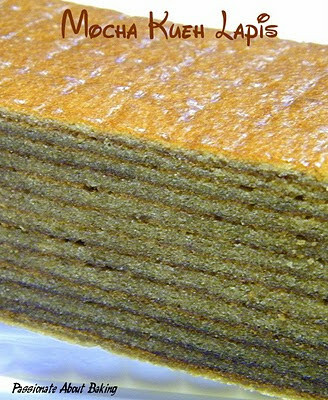 Instead of plain flour, I substitute it with wholemeal flour. I also added some fresh dill to give it a little herby taste. The dill was very mild and subtle. The buns turned out to be really soft, dense and sweet. I like it better when I can taste the dill. 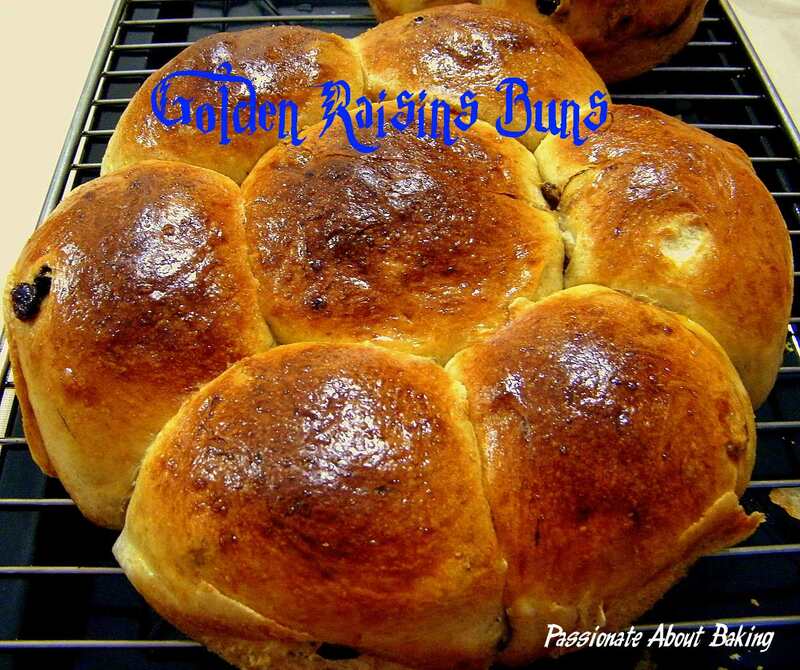 Recipe for Golden Crown Raisins Buns, extracted from "Baking Code"
1. Mix the instant yeast with 20g water until well-blended. 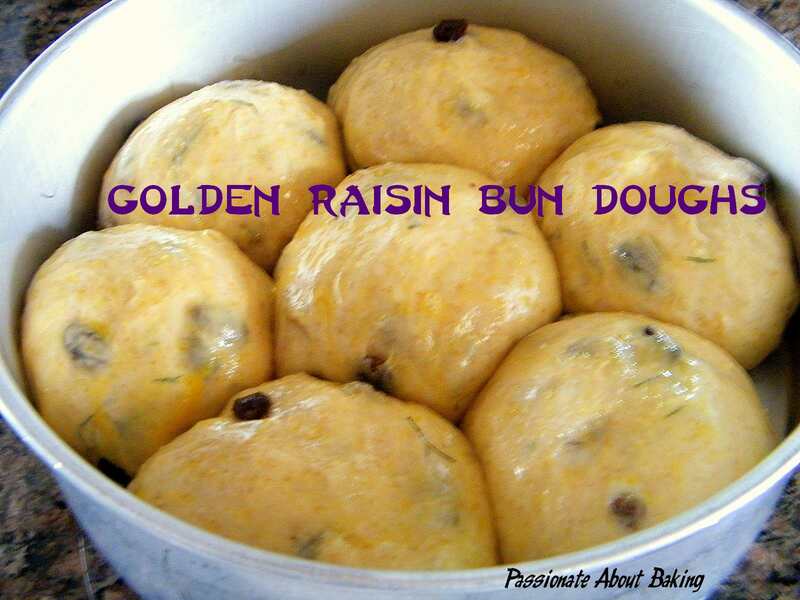 Add in the remaining ingredients and knead to form a dough. 2. Let it proof for 30mins. 3. 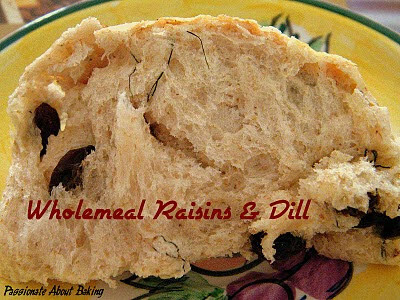 Wrap with cling fil and keep in the refrigerator overnight or up to 48hours. 1. Mix (A) until well blended. Add in (B) and (C), mix to form a dough. 2. Add in (D), mix to form a smooth and elastic dough. 3. Add in (E), mix until well-blended. 4. Cover it with cling film. Allow it to proof for 60mins. 5. Divide the dough equally into 10 pcs. Mould it round. Place 7 pcs of dough around the sides of a greased 9" round pan, and the rest on the greased 6" round pan. 6. Let it proof for another 60mins. 7. Egg wash the surface and bake it at 180C for 20mins. Actually, it's not easy not to bake at all in a week. Even though I told myself I should cut down on baking, somehow, I just had to plan some bakings over a week. Not to mention when there are birthdays in the family, I'll be happy baking away, no matter how busy I am. Just two weeks ago, I made a Coconut Layer Cake for my mum. 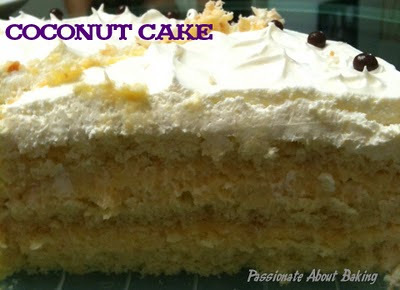 Frankly speaking, how many of us has tried good coconut cakes outside? Not me. 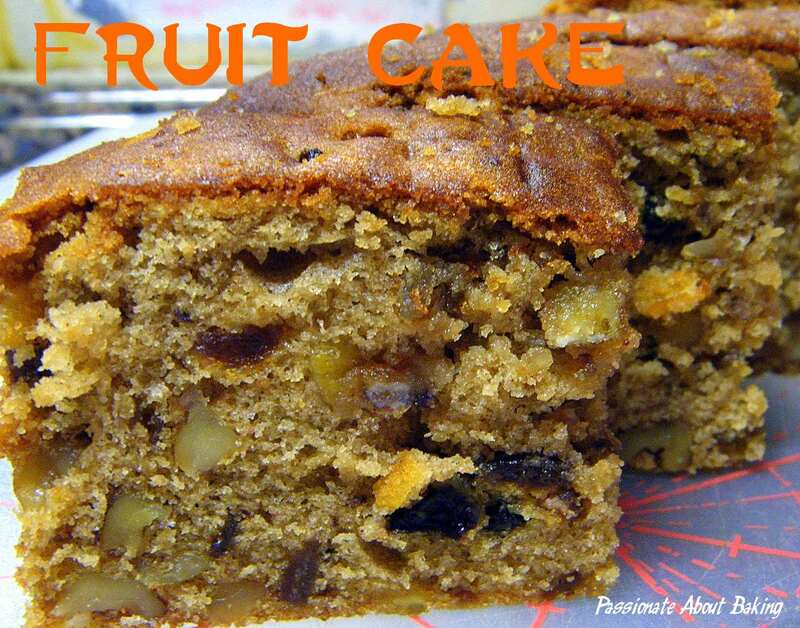 For I've actually not seen any cafes or bakeries selling coconut cakes. We know coconuts are usually used as complements to other flavours, for example pandan, or yam etc, but it was hardly the centre of attraction for most desserts or sweets. 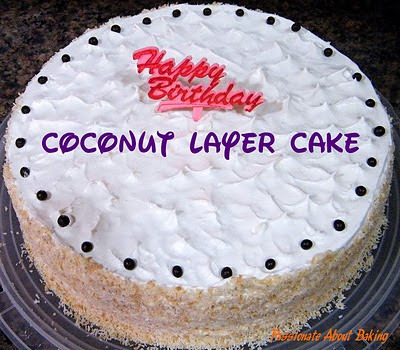 This Coconut Layer Cake is very unique. 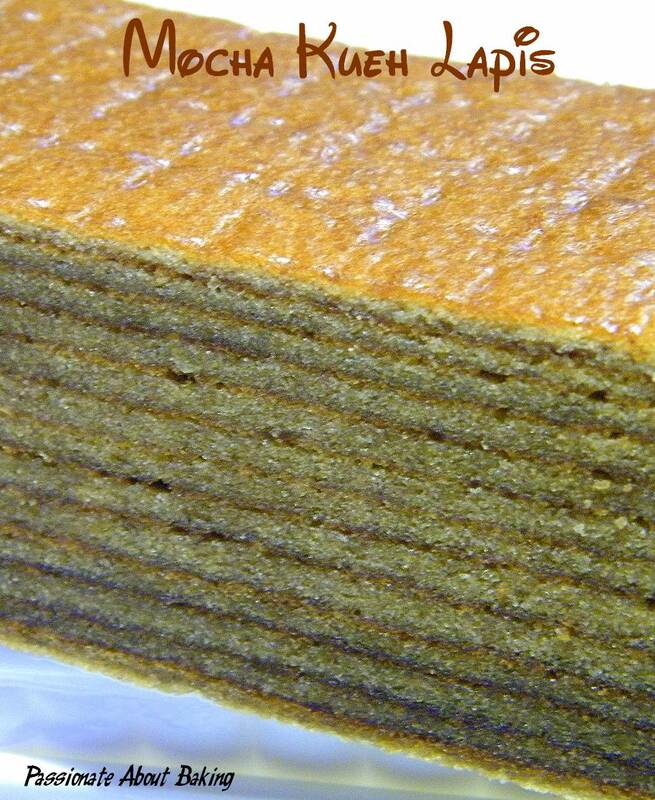 The cake sponge is made of desiccated coconuts, so is the custard cream. With the toasted desiccated coconuts coated at the sides, you can say, it's a whole lot of coconut! However, the taste wasn't too empowering. Which was why it was truly well received by many! Even my family members, who yakked at too much coconuts, found this cake to be specially nice too! Last weekend, it was my brother-in-law's birthday. Usually, they don't have any requests. So I just thought of what I would like to bake. 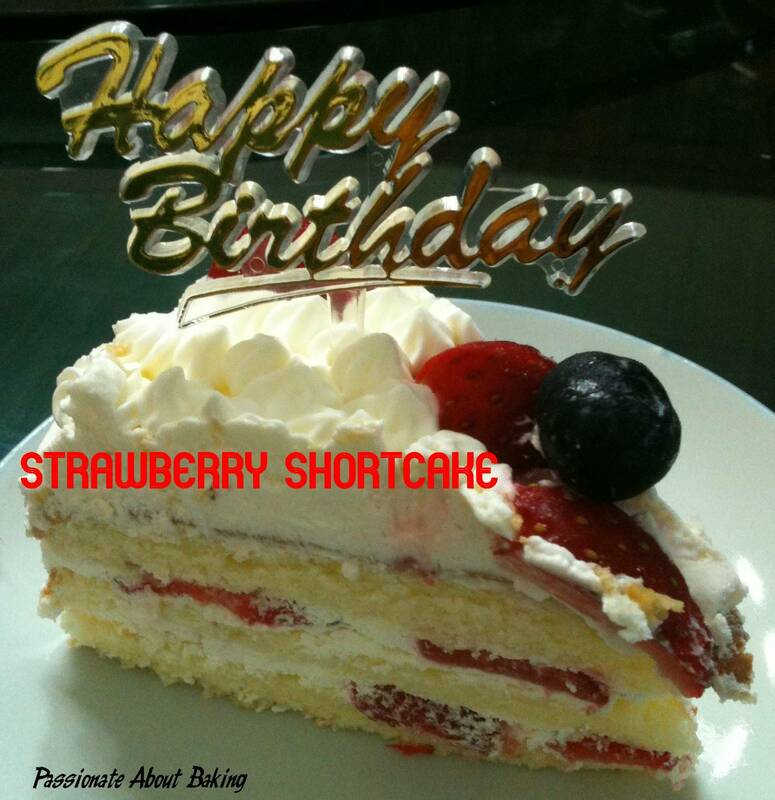 For him, I made a Strawberry Shortcake. This time, I tried a vanilla sponge cake recipe from Zu's Kitchen. It was quite dense but soft. I was glad they liked the cake. I used Korean strawberries which proved to be really sweet. The sweetness of the strawberries filled the air, prompting my sister to ask if I added any strawberry flavourings into the cream! 1. Sift ingredients (A) and put it aside. 2. Whisk yolks and sugar till it turns lemon color. 3. Add oil, water and vanilla and mix till well blended. 4. Add ingredients (A) and mix it slowly till it forms a smooth batter. 5. Whisk (C) till stiff. 6. Fold in 1/3 of egg white mixture into egg yolk mixture and gently stir, then fold in the remaining egg white mixture and mix well gently. 7. Pour batter into a lined 9" round cake tin. 8. Bake in a preheated oven 180C for 40 mins or till it springs back when touched. 9. 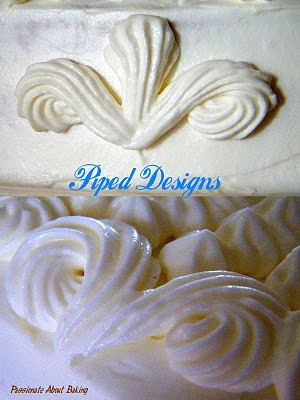 Once cooked, removed from oven and invert the cake on the wire rack until completed cooled. 10.Removed from mould and decorate. 1. Add whipping cream and caster sugar into the mixing bowl and beat till stiff peak. 2. 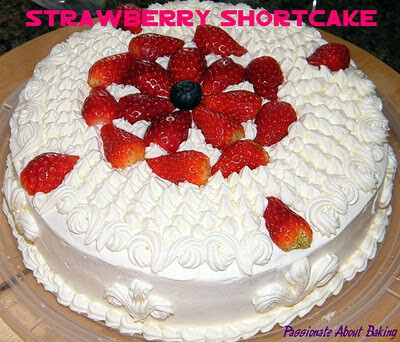 Frost the cake with chantilly cream and decorate with strawberries. I will be updating my blog less often starting from this month. My eldest son will be taking his PSLE and I will need to spend my time revising with him. As a parent, we have to set our priorities right. I might still be baking once a while, but might not update my blog. Lastly, I want to wish all a good baking year!